This is a Guest Post by Anjali Chopra, Business Analyst at GreyB Research. It has been less than a week and social media is abuzz with the news of LinkedIn’s acquisition by Microsoft. The deal that was finalized for a whopping 26.2 billion dollars is the largest software acquisition ever made. The move that is predicted by many as a catastrophic failure is in truth a well-planned move that would prove beneficial for Microsoft in the long run. We all are aware that LinkedIn and Microsoft are as different as chalk and cheese. One is a professional social networking platform while the other is a technology giant well known for developing business software. The collaboration of these two giants is a well-planned move that would benefit not just the organizations but the users too. Microsoft which has almost 1.2 billion users of its office suite software faces the risk of a decrease in number after the proliferation of Google apps, that provided almost all the services offered by Microsoft for free. For instance, after the introduction of Gmail, outlook had slowly been on decline and has only 400 million active users left which is really less when compared to more than a billion monthly active users of Gmail. Further, if the free counterparts of the office suite are widely adopted, Microsoft would stumble down the throne of business software where it is currently the king. To maintain its position in the market, Microsoft needed a backup plan that can help it remain steady in the market. LinkedIn, with its 433 million users had been a sole player in the social networking market with its services specifically catered for professionals. The data that comes along with the deal upon integration can offer great functionalities within the office suite which could help Microsoft maintain its profits obtained from sale of subscription plans. As the wise ones said- “User experience is primary”. The seamless integration between the two platforms would ensure a great user experience, which in turn could ensure that existing customers of Microsoft would not bid farewell to enjoy free services provided by competitors like Google. If you’re wondering what Siri’s competitor has to do with this acquisition, let me tell you, the personal assistant too would get smarter leveraging insights from LinkedIn. 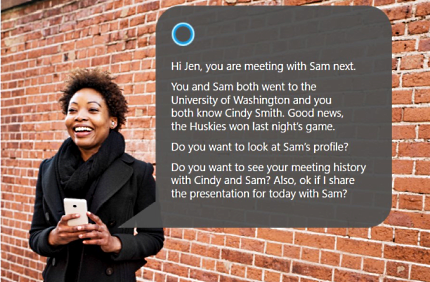 For instance, a look at the below image released by Microsoft can reveal the additional features and capabilities Cortana would have in the near future. Not only would it get easier to find out more about a client you are going to have meeting with and common things you share, the interconnected network would bring the functionalities of Office 365 along with machine intelligence to suggest decisions based on predictive analysis. In future, it can be the case that Cortana might suggest Elon Musk to forward the invitations to people travelling on the Mars colonial transporter to have a 360 degree look at their new out-of-the world homes. According to Wikipedia, Facebook has 1.65 billion monthly active users while 1.2 billion people use Microsoft office on a monthly basis. The 433 million users of LinkedIn can level the playground while helping Microsoft in its attempt to go social. If you’re wondering what makes us assume the intention of Microsoft to enter social networking sphere, we have proof to support our claims. Way back in 2007, Microsoft bought equity in Facebook in hopes to get started in the domain. Things did not work out and Microsoft sold most of its shares while retaining a few of them. In the year of 2012, Microsoft acquired Yammer for 1.2 billion dollars to enter the social networking realm. In the April of same year, it bought more than 800 patents from AOL for 1.1 billion dollars where the portfolio contained some of the first social networking patents ever granted. Continuing in the similar direction, Microsoft filed hundreds of patents in the social networking realm in an attempt to become a top player in the domain. For instance, consider the patent application filed by Microsoft titled Representation of people in a spreadsheet outlining different ways of representing people inside spreadsheets, with a variety of data about those people, and various forms of interacting with them. The spreadsheets might contain all the social information related to a person object mentioned in a spreadsheet along with a capability to post on social networks via the spreadsheet itself. A look at most of these patents reveal that the social network Microsoft is trying to build is not a competition to Facebook or twitter, rather, Microsoft had been working to build a social network that can serve as the go-to Enterprise social network in existence. The acquisition of LinkedIn has added Icing to the cake as the enterprise version is targeted for professionals. LinkedIn being a truly social network serves the purpose while providing data that can help Microsoft achieve its social goals. All in all, the 26 billion dollar deal if leveraged properly can help Microsoft become a premium brand in enterprise social networking domain while giving Cortana an edge over Siri. Microsoft has the opportunity to kill two birds in one shot. They have the bow and the arrow. Now whether they succeed in killing the bird or not is upto them. Anjali Chopra is currently Brand and Business Analyst at GreyB Research. She is also a technology blogger with a passion for globe-trotting.